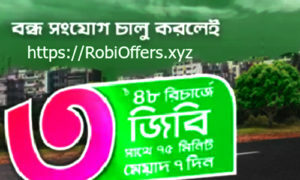 Robi announced a new offer for their inactive customer. In this offer the customer can avail 10GB intery by 101Tk and 3GB Internet with 75 Minute TalkTime by 48 Taka. Let’s know the details of this offer. 5GB for any Network and 5GB only usable in 4G Network. In this 3GB data 2GB for any network and 1GB is only for 4G Network. 75 Minutes talktime is usable for any local number. The validity of this pack is 7 Days (24 Hours). To check the eligibility of this pack for you go to your message option and Type A <space> Your Robi Number and send it to 8050. You can also check the eligibility by dialing 8050 from your robi number.